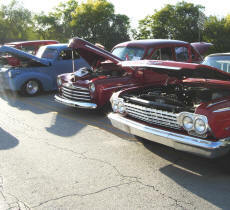 Cookees Drive-In Cruise Night Extravaganzas! Our cruises started out slow last July, and we are seeing each one grow! It is fantastic to see these owners come out and support our drive-in and allow the residents from several nearby towns, to experience and enjoy these great cars, trucks and motorcycles! Thanks to all!! See Our First Cruise Night Video!! Check back here for May's pics! Check back here for June's pics!